We apologize if the recent update has been confusing! We certainly could have done a better job documenting and pre-announcing these changes. We're learning from this and will do much better next time. We also understand that some of you are not huge fans of the changes - if that's the case, we're really sorry! Many of these changes came from large Facebook discussions and polls that involved a majority of our user base. We know changes are always tough and we feel like we are bound to upset somebody with every major change. We hope we can explain some of these updates better and help you see how they may be beneficial in the long run! 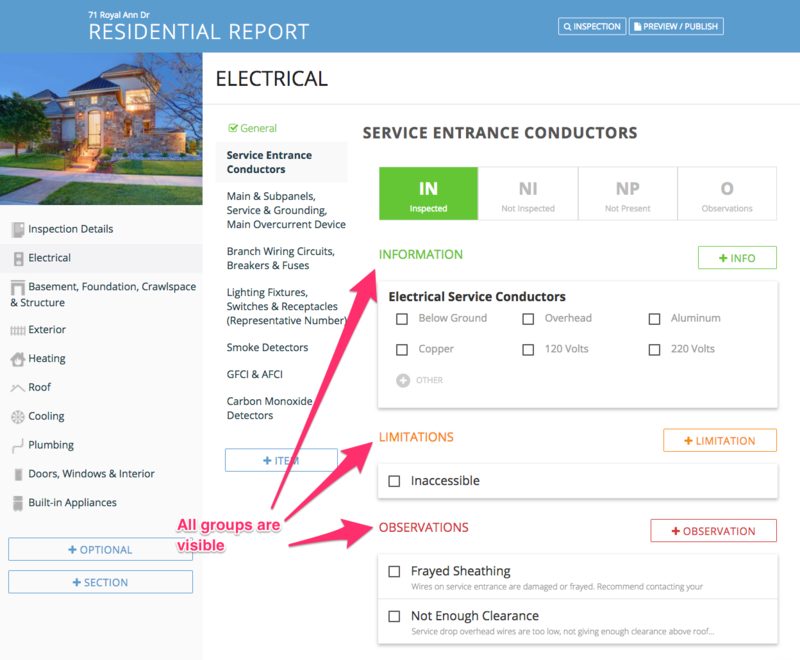 Comments grouped as "Info", "Limitation", or "Defect"
We were often asked "Where do 'Not Inspected' and 'Not Present' comments display?" On the report, these have always gone into a 'Limitations' tab. We've combined your NI & NP comments into a 'Limitation' group to make it easier to understand. Nothing changes in regards to noting if an item is "Not Inspected" - you would just scroll down to the Limitations group, find the "Not Inspected" comment that you would usually use, and mark it. If something is "Not Present", you would either input a Limitation comment or delete the item - the same as before. Of course, many of you put comments like this in the Information group - you still can, nothing else has changed in that regard. Important Note: This does affect the progress/completion of a report on the mobile app. If you have an NI/NP item with informational comments, you will have to do either delete the informational comments or mark them "NA" for the item to complete and turn green. Bottom Line: All your NI/NP comments are still there! They work the same as before! And they show up in the same place on the report! 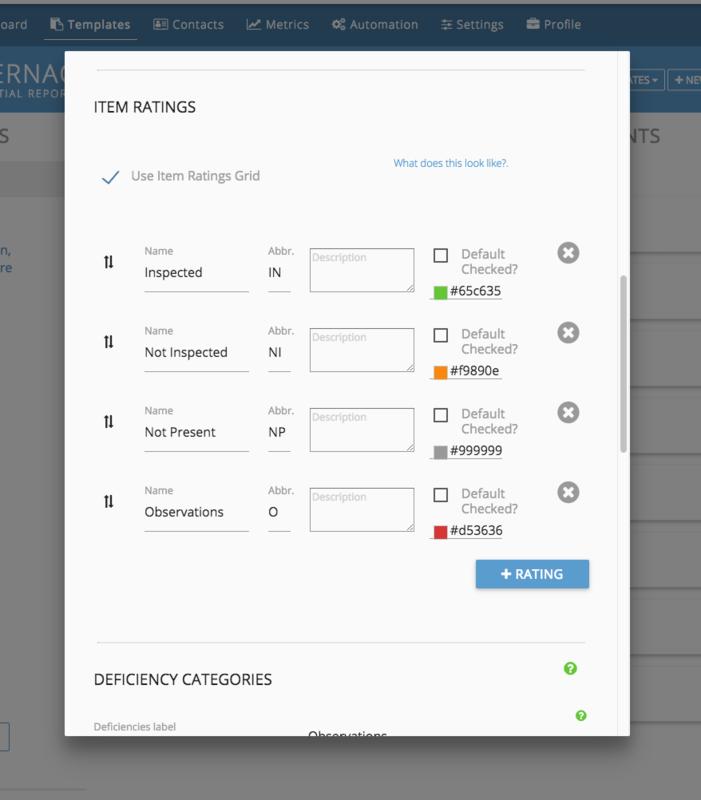 We've had numerous requests for customizing ratings so you can create different inspection template types, such as mold, radon, etc where the standard IN/NI/NP/D didn't apply. We also had an almost-unanimous FB poll requesting we unlink these ratings from each other to allow greater flexibility. Previously, marking one would affect the others (i.e. hitting "NI" would turn off "IN"). The vast majority of you wanted the ability to have any combination of these turned on at the same time, allowing you to mark information, limitations, and defects in one item. Now both changes are here! You can customize your ratings in the Template Editor. Just click on the template name to edit. By allowing custom ratings, we no longer show/hide comment choices based on ratings. Now all your comments are visible in the groups mentioned above. This allows flexibility for marking informational comments (roof material, type, etc.) as well as limitations ("Could not inspect roof due to snow.") in the same item. 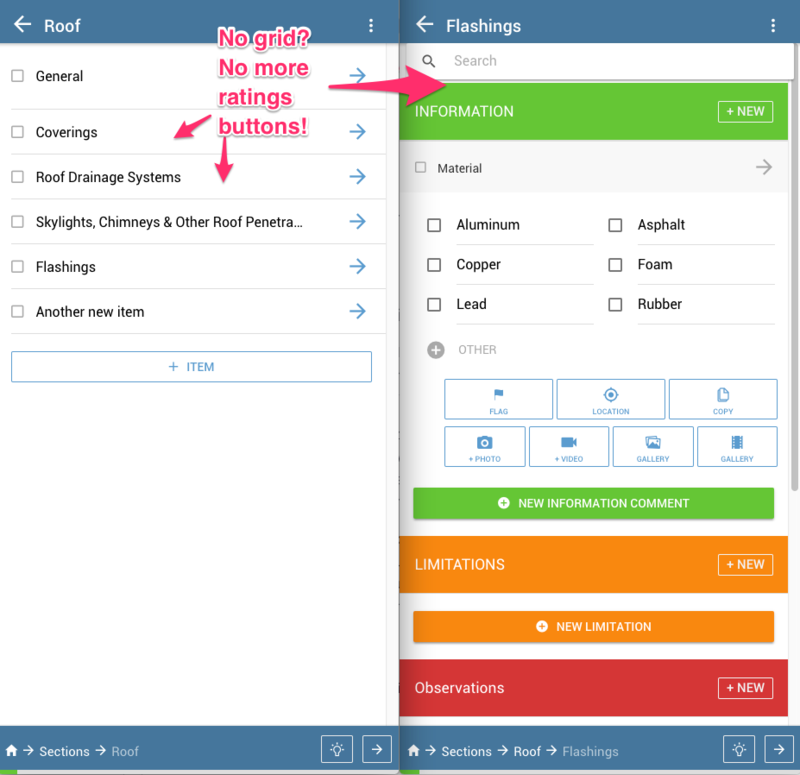 Bottom line: You now have more options for customizability with templates! By popular demand, all the global settings related to templates & reports have been moved to the template level. This means you can have different settings (categories, grid display, etc.) for your different templates. It also means that settings lock in when a report builds from your template. We recommend you pop into your templates and double-check that settings are how you want them. We defaulted all your templates to the settings you previously set up in the Settings->Report Display options. In the Template Editor, just select your template then click on the name to bring up the options. Attention! If you do not use the grid to display ratings (IN/NI/NP/D), you won't have the IN/NI/NP/D buttons display. (The only thing they do now is display on the ratings grid.) Hopefully that clears up clutter! If you use the ratings grid, you'll still see those buttons with every item. Let us know any questions that you have!